We explain all the landmarks of the famous Piazza San Marco, St. Mark’s Square, the former political centre of the Venetian Republic. Then we enter the Gothic Doge’s Palace, once the seat of the government, where the Doge, the ‘leader’ lived and together with his advisors and politicians decided the fate of Europe in the 15th and 16th C. We admire in the courtyard the impressive Giants’ Staircase, we ascend the magnificent Renaissance Golden Staircase and reach the amazing rooms decorated with paintings by Veronese, Tintoretto and Titian. We cross the well-known Bridge of Sighs to walk through the empty cells of the former prison building (approx. 1 hour 15 min). The tour ends with a short visit to the oldest church in Venice, St. Mark’s Church (approx. 10 min). We admire all the landmarks of the famous Piazza San Marco, St. Mark’s Square, the former political centre of the Venetian Republic. 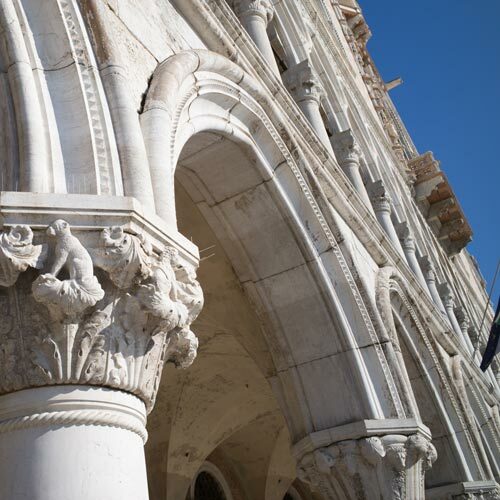 The Gothic Doge’s Palace, once the seat of the government, the former prison building and the Bridge of Sighs will be all explained from the outside. 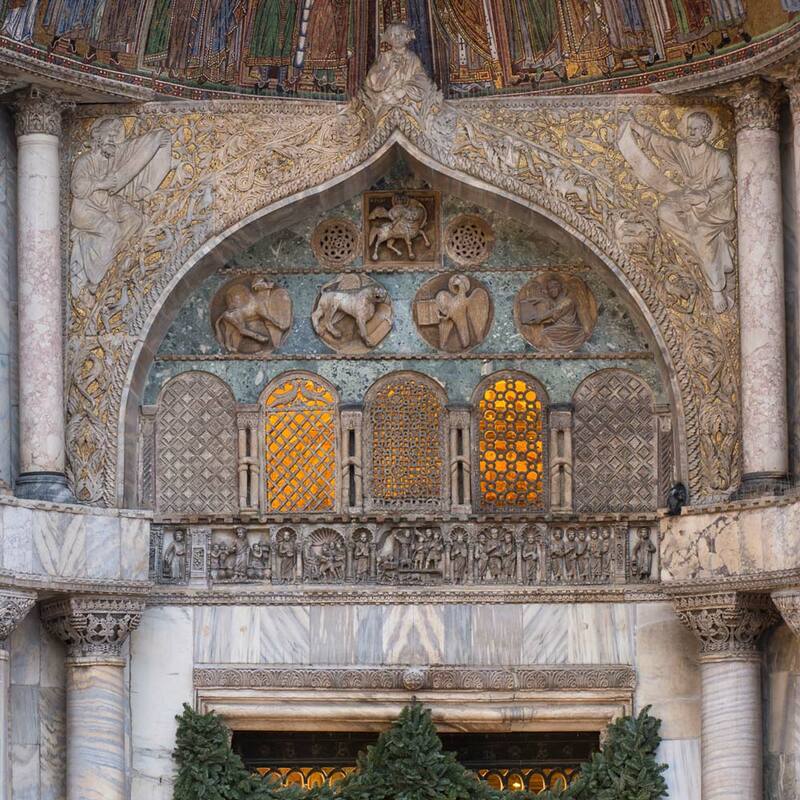 We admire St. Mark’s Church with its breathtaking glittering mosaics and visit either the spectacular Pala d’Oro or the Quadriga and the Terrace (small parties only or groups with whisper device – approx. 40 min). Through the main shopping street we walk over to the oldest bridge on the Grand Canal, the Rialto Bridge. 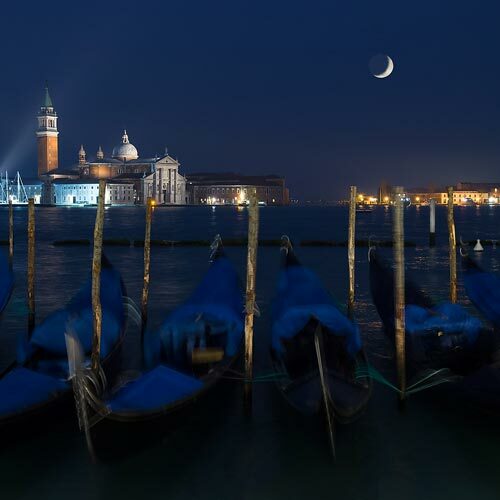 We discover how Venetians ruled over part of the Mediterranean thanks to luxury goods imported from the Far East and admire the former trading centre, now the still lively fruit, vegetable and fish market. We start with all the landmarks of the famous Piazza San Marco, St. Mark’s Square, the former political centre of the Venetian Republic. The Gothic Doge’s Palace, once the seat of the government, the former prison building and the Bridge of Sighs will be all explained from the outside. We walk briefly through St. Mark’s Church with its breathtaking golden mosaics. From there we walk through a labyrinth of narrow streets over to a charming square Santa Maria Formosa, over to the bookshop with books in boats, bath tubs and barrels (only for small parties) up to Marco Polo’s former house. We learn about the stunning travels of this adventurous Venetian explorer of the Middle Ages. We then finish our informative introductory walk by the Rialto Bridge and the Grand Canal. We start with all the landmarks of the famous Piazza San Marco, St. Mark’s Square, the former political centre of the Venetian Republic. The Gothic Doge’s Palace, once the seat of the government, the former prison building and the Bridge of Sighs will be all explained from the outside. We walk briefly through St. Mark’s Church with its amazing golden mosaics. 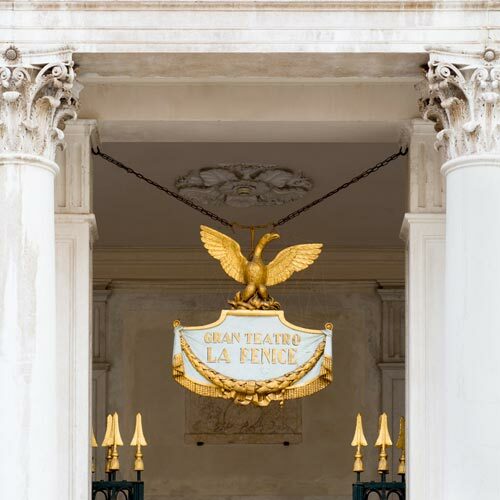 From there we reach the Opera House La Fenice, rebuilt after an arson fire 20 years ago (Verdi first represented here La Traviata). 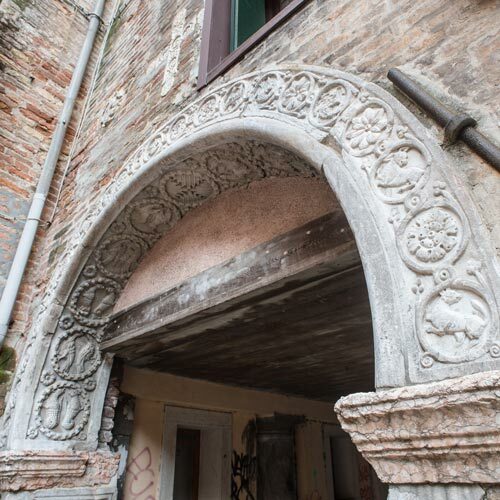 Through narrow quiet backstreets we spot in the distance a slightly leaning bell-tower and we stop by a fascinating early Renaissance hidden spiral staircase (we can also walk up to the panorama terrace). We end our detailed overview walk by the Rialto Bridge and the Grand Canal. If you wish to spend your day touring cities on the mainland (like Padua, Vicenza or Verona) or if you just enjoy sunbathing out on the Lido or in one of the hotel pools, then the night tour is a perfectly designed informative and entertaining tour for first-time visitors to cover all highlights! When the sun sets Venice acquires a magical fascination. We tour in the twilight the former political centre, St. Mark’s Square, we discover the history behind the Gothic Doge’s palace, the Bridge of Sighs and the prison building. We also hear stories about the bell-tower, the clock-tower and the National Library. Then listening to our steps echoing through the dimly-lit streets we reach the Rialto Bridge, the former trading centre.